Back in 2009 my company, Alagad, had what I think of as The Big Layoff. We went from about 13 employees and contractors down to three people in a matter of a fifteen minute phone call. This wasn’t the first round of layoffs I’ve had to do, but it was the hardest. I loved the people who worked with me. I cared about them and their families and I felt as though I had personally failed them. Frankly, I did. I’m sure that I could have done more to protect them, their jobs, and their families. That said, they’ve all gone on to bigger and better things and I’m extremely happy for them. In the year or so leading up to these layoffs I was constantly assaulted with panic attacks. My chest would seise, I’d get tunnel vision, my mind would shut down everything except worry. White hot worry. I worried about the people who worked for me and the overwhelming responsibility I had to them. I worried about paying my bills. I worried about my family. Through the support of my family, the remaining employees, and the miracle of modern pharmacology I somehow made it through that period. Sometimes I wonder if I didn’t completely fry my nerves. I wonder this because I am again tearing Alagad down. Three weeks ago we were faced with the very real fact that we would likely go out of business. Both my personal and business accounts were overdrawn and we couldn’t make payroll. Again. We had to leave the PEO that provided our health benefits and payroll service. The walls were coming down. So I held a call with all four of us, three family members and one employee who may as well be family at this point. We talked about shutting down and what that would mean. Throughout this experience I felt calm. Not happy, but calm, collected. Worried too, but not like in 2009. I sincerely felt as though I had done everything I could and that, if we failed, no one could blame me for not trying. What’s interesting to me is that I don’t feel the same panic I did in 2009. I don’t feel like a hole is being burrowed in my chest. I can breath and sleep. I’m not entirely sure why. I imagine that when death is imminent – when you are terminally ill – that a certain peace and calmness comes from that knowledge. I imagine that you release your desperate grip on everything that holds you to the physical world. Nothing can harm you now. There are no more consequences. You transcend fear. That’s where I am. Nothing can hurt me now. And strangely, because of this, I am free. I can do anything I want. I can take tremendous risks without fear. I am like the terminally ill patient who decides to live each day as if it were their last, because it might be. Much to my surprise, out of that phone meeting was born an entirely new strategy we’re calling Alagad 2.0. I’ve detailed it on an all-new Alagad.com website and will spare you the details here. Suffice it to say it’s not the traditional way of running a software company. I feel like the terminally ill patent who is given experimental treatment. It might save their life, but might just kill them even faster. There’s only one way to find out and I’m comfortable with this. I can’t lie and say that I’m entirely at peace. I still worry. We don’t currently have health insurance and we depend on our prescriptions for our mental well being. Many have criticized our new approach saying that we don’t understand the business. But others have suggested it’s might actually be a good idea. Maybe I’m just delaying the inevitable, but I’m ok with that. The picture that has emerged to me is that there is in fact life after death. It’s a rebirth of some sort – a renaissance. A new start. I look forward to it with an open and calm mind. I’ve mentioned in the past that I was working with some people to start a new non-profit called Supporting.us. Unfortunately it looks Supporting.us is dead in the water. 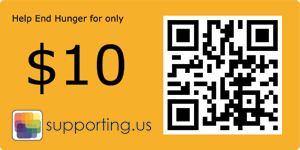 Potential donors would recognize these codes and could scan the QR code in the image with a QR reader on their smart phone. This would take them to a mobile-optimized web page where they would be able to make a donation with a single click. Unfortunately, this won’t fly. This falls under the realm of Third Party Payment Processing (TPPP) and I have been unable to find a way to work around this. The problem is that credit card processors do a credit check on merchants (IE: Supporting.us) before they let them process credit cards. With Supporting.us, we were essentially wanting to extend that processing capability to our customers, the charities. But, since the processor wouldn’t be the ones deciding if our recipients were worthy of credit, they wouldn’t approve us. Basically, it’s too risky for them. What if we let someone use our system and they are fraudulent? The processor will end up holding the bag on the chargebacks, not Supporting.us. We’ve tried a few different processors and keep running into the same problem. There’s still a chance we might be able to work around this, but I’m not sure how. However, this experience got me thinking about mobile payments, which is, well, a huge area of investment at the moment. You have the up-and-coming NFC technology where you can just wave your phone by a reader, rather than whipping out your credit/debit card and sliding it through the reader. (I’m excited about NFC!) There are also card readers that can attach to phones for mobile payment processing. While both of these are awesome, they don’t really change how people actually make purchases and interact with stores. So, I had an idea: What if you could change the way people buy things in stores altogether? Think about this: What if you could walk into Best Buy (or any other retailer), find the merchandise you want to purchase, scan the barcode on the product using an app, and click one button to make your purchase? At this point you’d own the item and could walk out the front door, skipping waiting in line. Your phone would show a receipt for your purchase with a QR code that contained encrypted information about your purchase. On the way out of the store, Best Buy’s security guys would scan your receipt’s QR code with their own mobile device to validate it. This would lookup your purchase and confirm that the receipt is valid and that the user hasn’t already left the store before with this product. Heck, this could be put into a stand-alone kiosk to remove the human element from the equation. As a note, buyers would enter their credit card information into this app the first time they used it. This would be securely stored either on the phone itself or, perhaps, in a PCI compliant data store in the cloud. There are a couple of things that make this distinct from the failing Supporting.us concept. First off, this business (let’s call it HappyPayments Inc, for the sake of a recognizable name in this article) would itself be a credit card processor. They would fulfill the same role as First Data, or any other processor. Basically, companies that want to use the HappyPayments to process mobile credit card payments would use their existing merchant account, but would use HappyPayments as the processor. This would not prevent them from continuing to use the same payment processor they currently use for in store and online purchases. HappyPayments would have an API that the merchant could use to either populate HappyPayment’s database with store locations, products, prices, inventory, etc. Also, HappyPayments would also be able to call web services specified by the client to dynamically get this information. Of course, it could also be manually managed if merchants so wished. So, when I’m in Best Buy making my purchase, I select where I am from a list of stores near me that use HappyPayments. This would be similar to how FourSquare works when you check in. Using this, when I scan the product’s barcode, HappyPayments is able to lookup the price of the product at that store at that time. When purchases are made, HappyPayments can relay that information back down to the store’s POS via a standard web service API (if the client wishes to implement this feature). The fees for using this would be similar to any other payment processor gateway: A small percentage and a small transaction fee. The mobile app would be free on the various app stores. Any deeper or custom integration with store systems would likely have associated fees. But, the idea here is to make money off of the transaction fees and not from the consulting fees. This helps lower the barriers to entry and makes it easier for merchants to start using this service. Now, this is not a simple nut to crack. How does one get started? Well, it seems that if you want to break into being a payment processor, there are some fairly high costs and legal requirements. To get around this, new companies will often partner with existing processors. So, that’s the approach to the first problem: partner with a payment processor to avoid having to actually be a payment processor at first. As a part of the partnership, the processor would get a significant percentage interest in HappyPayments. Secondarily, how do you get any sort of scale to get started? And how do you finance development and the initial work that needs to be done? Well, again, you partner. In this case, I’d love to partner with a business like Best Buy. They would make an initial investment to build this app (and business). They would get exclusive use of it for a period of time while kinks are worked out. In exchange for this investment Best Buy would also get a significant percentage of the company. While that more or less wraps up the idea, I wanted to add that I recently learned that Stephen Gillett, who pioneered StarBuck’s recent forays into mobile payments, has moved to Best Buy where he be doing the same thing. If I had a way to get in touch with Mr. Stephen Gillett, I think he might just be interested in this concept. Who knows? Anything’s possible, and it never hurts to ask.